I do like Cofresh crisps and nuts so when I saw this bag in the local supermarket I just had to pick it up. It states "Spicy" on the fire engine red packet and I know just how spicy Cofresh's nuts and Bombay Mix can be. These chips are made from raw Cassava, which is a plant that I hadn't heard of before. 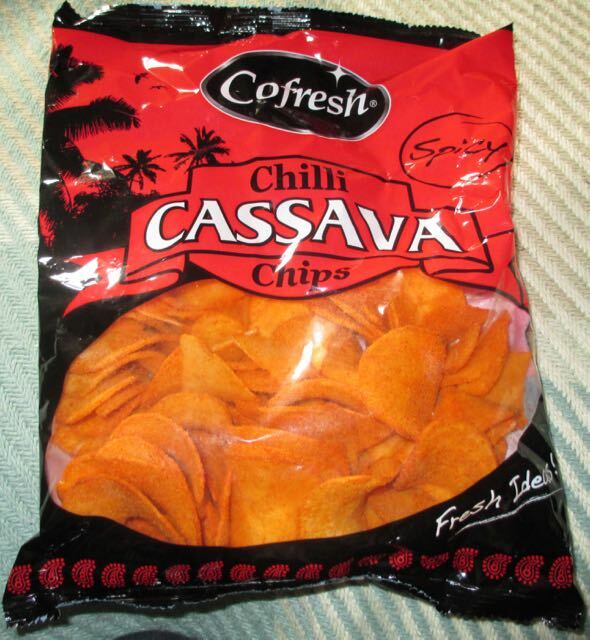 There were palm trees in the background on the packet which made me assume that Cassava was native to the Caribbean, but it's a plant that's native to Brazil. Apparently you can cook the leaves and root, which makes for a great source of calcium and vitamin C. On opening the big bag there was kind of a plant smell rather than the usual potato I'm used to. If someone just gave me these crisps in a bowl from the smell rather than the look I'd be able to tell that they weren't made from potato. These crisps are very crunchy, much more than normal potato crisps. So when trying these crisps make sure your gnashers are ready. If there are two crisps stuck together then you may need a hammer (seriously). Once you've got used to the strong starchy bite the chilli kicks in and boy it really does kick. If you like your crisps chilli hot then you can't go wrong with these crisps. The heat made my eyes water a little and set my tongue and mouth on fire. After a few crisps my nose started to run uncontrollably. I was too afraid to stop eating them once I'd started, but the shear chilli burn made them quite uncomfortable. I reckon these are the hottest crisps I've ever eaten. I know I've probably said that in the past, but I did stop eating them after a while in favour of cold salad, some fruit and finally a yoghurt to cool my mouth down. Phew! 180g packet has 483 calories per 100g having 21.16g of fat. The ingredients struck me as very simple being Vegetable oil, Cassava, chilli powder and salt.